I recently visited the Fountain of Youth in St. Augustine. I thought I would share some helpful tips in case you’re planning on visiting and a list of fun things to do while you’re there. This famous landmark is one of the most popular places to visit in Florida. Legend says Spanish explorer Juan Ponce De Leon was searching for the Fountain of Youth during his explorations of Florida in the early 1500s. And this story gained foothold hundreds of years ago — that’s when the Fountain of Youth was referenced by Spanish historian Antonio de Herrera y Tordesillas in a popular 1601 account of Ponce De Leon’s first voyage. Tordesillas wrote that the vitality-restoring water source could turn “old men to boys.” The legend captivated millions in Europe. As Spain relinquished Florida in 1819, the state joined the Union in 1845, and the story captured American hearts, too. 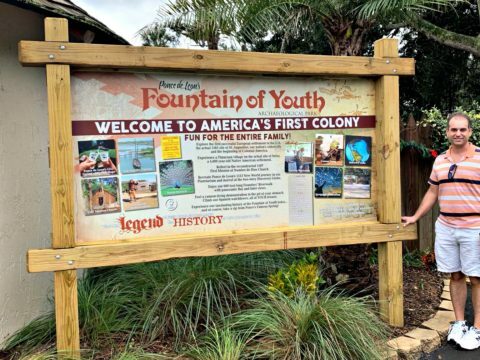 Growing up in Florida, I heard about the legendary landmark my whole life — but I hadn’t visited the Fountain of Youth in St. Augustine, FL until I was in my mid 30s. The Fountain of Youth is located in the archeological park compound on 11 Magnolia Avenue. It’s just a few steps off San Marco Avenue — one of the main roads running north and south through the touristy area of St. Augustine. The Fountain of Youth Archaeological Park itself sits on 15 waterfront acres. There’s onsite parking at the Fountain of Youth Archaeological Park, but a lot of people park their cars at the Historic Downtown Parking Facility garage (at 1 Cordova Street) and hop aboard a tourist tram. Both offer easy hop-on, hop-off access once you buy a pass. The tram passes usually include merchant and attraction discounts — so be sure to check and see if there are any combo deals currently being offered by the tram services. And check the St. Augustine Visitor Center for discounts on Fountain of Youth tickets, as well! Once you’re in Fountain of Youth Archaeological Park, you’ll be able to get around and see pretty much everything in 3 or 4 hours. 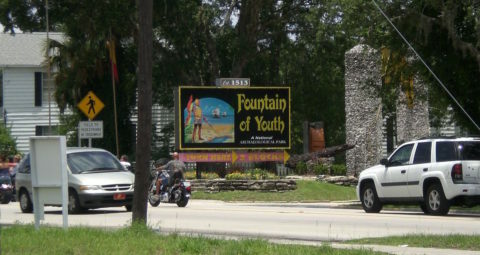 The Fountain of Youth is located inside a coquina building called The Spring House — near the entrance of the archaeological park. Once inside, you can take a small plastic cup (provided), fill it with water from the spring, and drink from the Fountain of Youth! The water has a slightly sulfurous, mineral flavor. In fact, there are reportedly more than 30 minerals in the Fountain of Youth water. Well, the bald spot on my head hasn’t gotten any hairier since I drank water from the Fountain of Youth… but there may be a delayed response. Still, I’m glad I finally got to see the Fountain of Youth and taste its water. 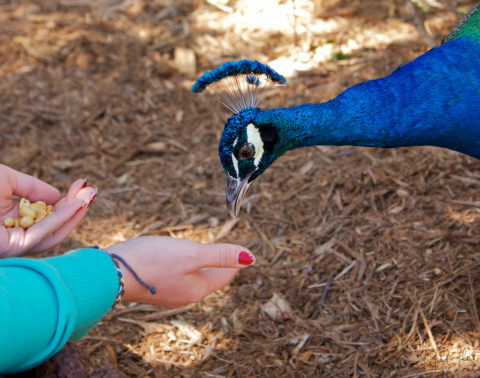 The first things you’ll see upon entering Fountain of Youth Archeological Park are a pride of peafowl. These large birds scurry across the grounds, roost in the trees, and entertain visitors throughout the day. I had just as much fun watching the peacocks go about their business as I had enjoying the other attractions at the park! This fascinating show explains how Ponce De Leon and other explorers from his time used the stars to navigate across the waters and discover new lands. 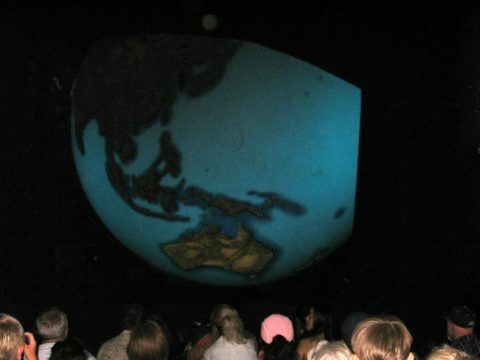 This theater hosts a show featuring a 30-foot-tall replica of Earth vividly illustrating the routes Ponce De Leon and other explorers took to the New World, the original extent of the lands of La Florida, cities and settlements, and the various universities these settlers and their immediate descendants founded. Watch a period actor demonstrate how everyday metal items (such as construction nails) were made using fire reaching 2,500 degrees Fahrenheit, precision skill, and a little sweat. 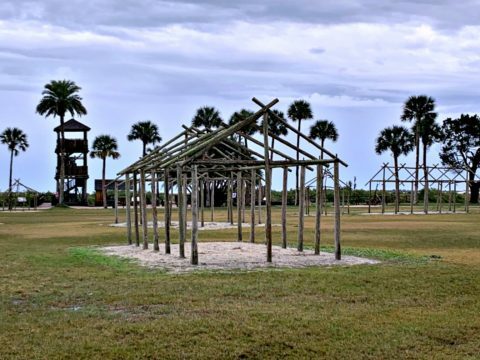 This palm-thatched, open cypress beam structure is a reconstruction of a church that was built on these grounds by Franciscan friars in 1587. 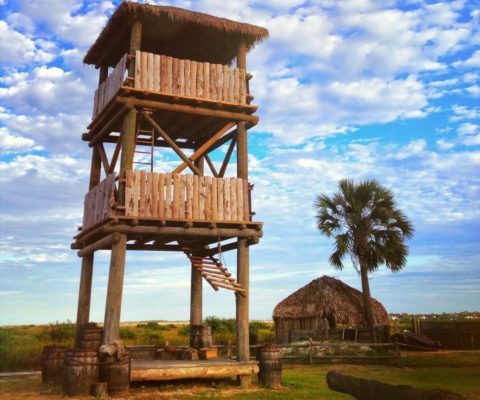 A 3-story-tall wooden lookout tower at the Fountain of Youth grounds is a replica of the many watchtowers the Spanish constructed along the shore in the early days of settlement to keep guard from attacks. A journey through the Timicuan village brings you into the everyday lives of the native peoples who inhabited northeast Florida at the time of Spanish settlement in the 1500s. The Timicua and Spaniards coexisted for a period, but tensions rose and European diseases overwhelmed the native peoples — the last of whom died in the early 1700s. #9 – Menendez Statue — Ponce De Leon may have landed in what we now know as St. Augustine in 1513, but the city of St. Augustine itself was founded in 1565 by another Spanish explorer named Pedro Menendez de Aviles. A majestic 6-foot-tall statue at the park honors the local icon. You should be able to see all of the attractions at the Fountain of Youth Archaeological Park in half a day — if you plan carefully. On the day I visited, the shows and demonstrations were scheduled in tight, consecutive order. This made it really easy to see everything without much lull in between the shows and other activities. 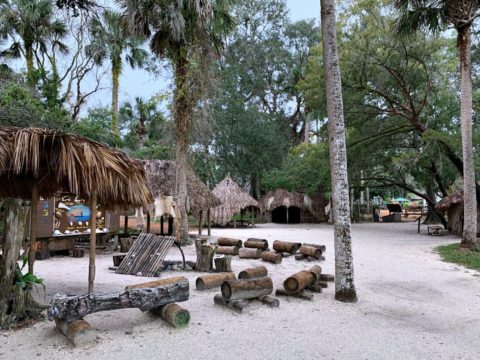 The Fountain of Youth Archaeological Park in St. Augustine is the site where many claim Ponce De Leon made his Florida landing in 1513. Did you know?… The park also contains a freshwater well that many believe was also sought by Ponce De Leon and was referenced by Tordesillas in his work, Historia general de los hechos de los castellanos en las Islas y Tierra Firme del mar Océano. Some say that Ponce De Leon may have landed closer to present-day Melbourne Beach — about 140 miles south of St. Augustine. There’s much conjecture about the historical connections at Fountain of Youth Archeological Park. But there may be some truth behind the legend after all. So, get this… Excavations in the 1990s on the park grounds turned up remains of the first Spanish settlement — including a cemetery and fortifications! Planning a trip to St. Augustine soon? Here are 5 of my favorite St. Augustine attractions and 15 cool & unusual things to do there.